You can click to embiggen slightly. 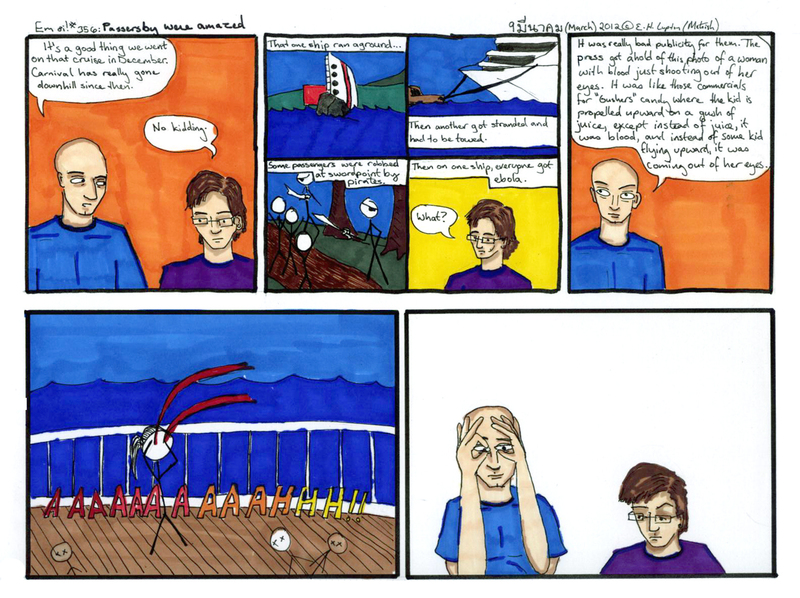 The panel second from the end (the fourth or seventh panel, depending on how you are counting) was designed by Bryan. I owe him considerable thanks for help on this comic generally. Also the final panel might be one of my favorites ever. I have so much to write that I’m not going to write, because now I’ve got to go do some homework and go to bed. That is very much a summary of my life over the past several weeks, and I can only hope that it will get better during spring break next week and I might be able then to write something. Biology (General)—Ecology—Influence of special factors in the environment—Special, A-Z—Cruise ships. If you’re into Twitter, you can follow me at @pretense_soup. I personally find Twitter to be like a giant party where everyone is shouting witticisms at each other as loudly as possible–in other words, intimidating, so I don’t tweet frequently. But I assure you that when I do they are naught but the ripest, freshest, wittiest tweets available. So you should follow me. Lupton, E. H. “Our Honeymoon–A Recap, parts 1-3.” Em oi!, no. 308, 10-12 April 2010. Retrieved from Part 1/3, Part 2/3, Part 3/3. Ronson, Jon. “Rebecca Coriam: Lost at Sea.” The Guardian, November 11, 2011. Retrieved from http://www.guardian.co.uk/uk/2011/nov/11/rebecca-coriam-lost-at-sea?CMP=twt_gu. Wallace, David Foster. “Shipping Out: On the (Nearly Lethal) Comforts of a Luxury Cruise.” Harper’s Magazine, January 1996, 33-56. Retrieved from http://harpers.org/media/pdf/dfw/HarpersMagazine-1996-01-0007859.pdf target=”_blank”.